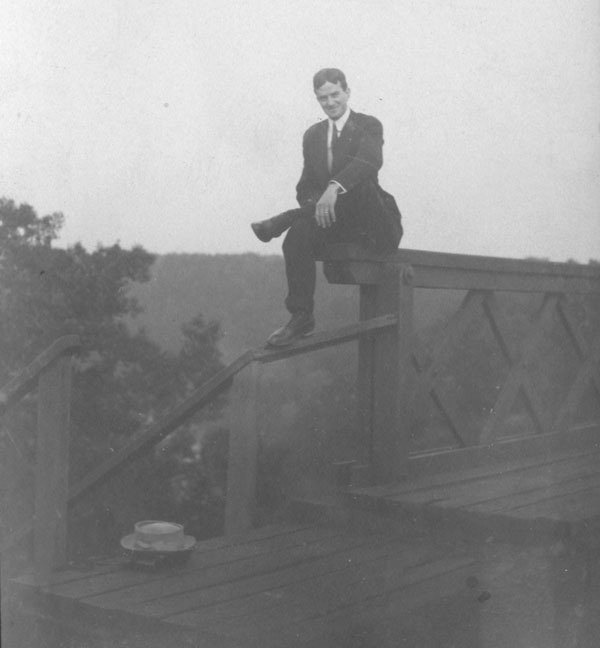 Sometime, around the beginning of the 20th century, a young woman and her friends spent a day at Portage Falls and the Glen Iris Estate of William Pryor Letchworth. All that is left of the day trip are snapshots found together in an album in the possession of the Genesee Falls Town Historian. 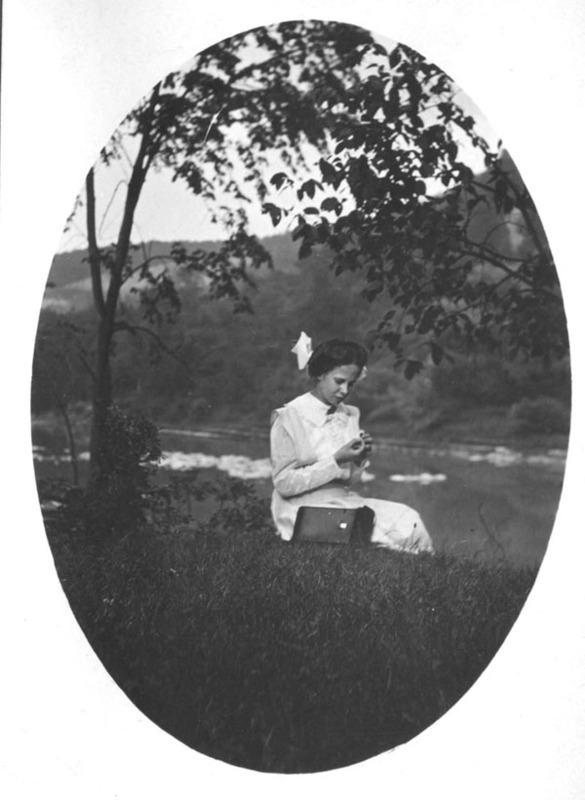 There are no clues in the album as to who the people are or exactly when these images were taken, but the photographs tell their own stories of Letchworth Park a century or more ago. We thank Town Historian John Quinn for allowing us to use these photographs. If anyone recognizes the individuals, please let us know! Our tourist has arrived at Portage Falls. It is quite possible that she and her companions came on one of the frequent excursion trains. 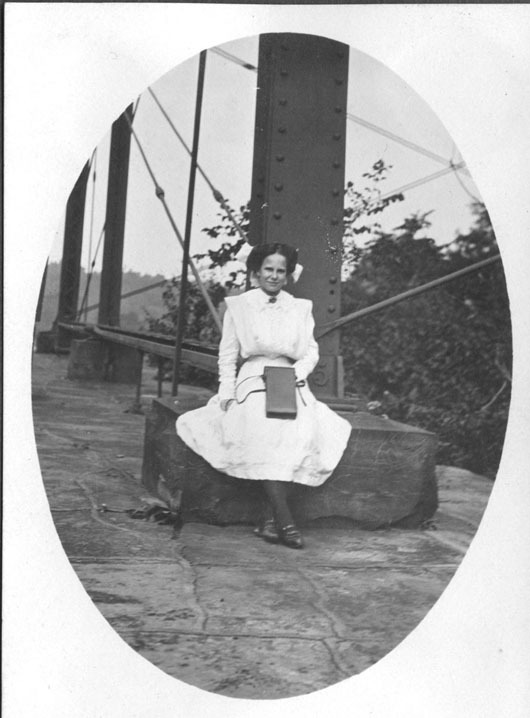 If she came on the Erie, the train had deposited them near the Cascade House. If that is the case, this photograph could have been taken near the end of the trek across the bridge. 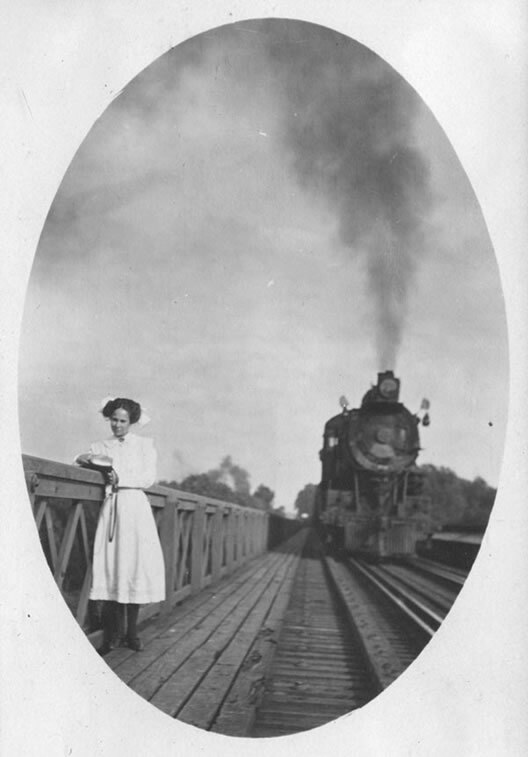 The young lady does not seem concerned about the approaching train. Perhaps it has stopped on the bridge, or she is confident she has enough room near the railing. It is the photographer who is in the most danger! This appears to be our young lady's companion. Or perhaps more than that - he is showing off a shiny wedding ring in the photograph. He is sitting on the edge of the railing at the west end of the Portage Bridge. His hat and some other things he was carrying sit near the top step of the stairway leading down from the deck of the bridge. After walking down from the bridge, they have stopped to rest in the shade along the river bank between the Upper and Middle Falls. The Genesee River is behind her. On the far bank, to the right, is the Slide Area. Our young friend is examining something, perhaps a small wild flower or clover. Perhaps the open case next to her held a camera. It appears in all her photographs. 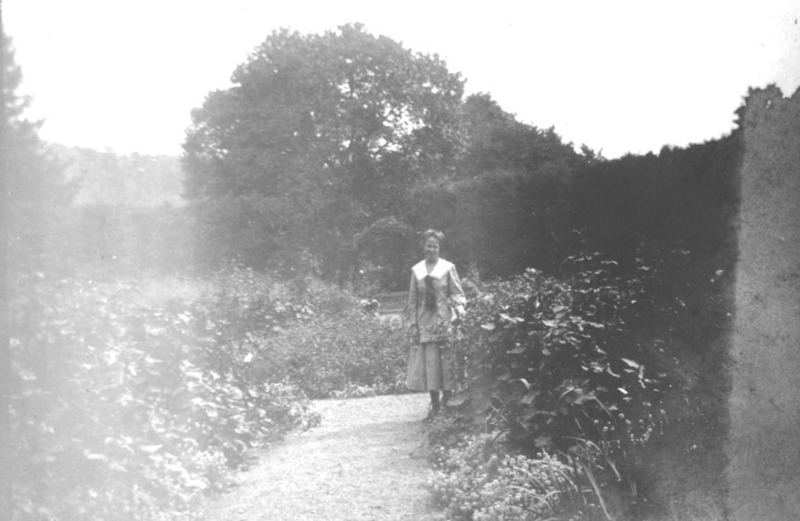 Now, who is this standing in Mr. Letchworth's beautiful garden? If the photograph below was indeed taken the same day as the others, it means that there were two young ladies in our party. This one appears to be a little older perhaps and may be the married one. The gardens once stood in the area of the modern Park Museum. The entrance way is behind her, beyond the flower beds. Sometime during the day, the party journeyed under the Portage Bridge. Our young lady is sitting on a large block at the base of one of the towers. You can just see a "5" on the beam behind her. That is part of "1875", the date the bridge was built. The date is still visible at the base of the present bridge. This final photograph may the last member of our party - he doesn't appear to be the same young man who sat on the railing of the Portage Bridge. Perhaps he is with the lady in the garden? 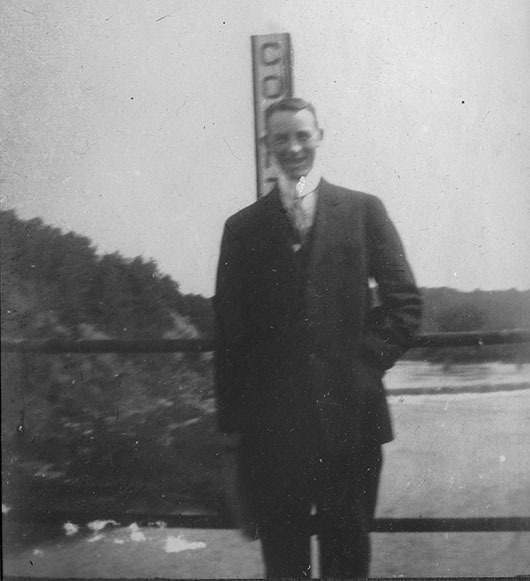 The photograph appears to have been taken from the Pennsylvania Railroad Bridge at Portageville. Although we don't know who these people were, or the real events of their day these images from an old photograph album provide an interesting view of people enjoying an outing at Portage Falls and the Glen Iris. If you have similar images from the Park's past, please share them with us!